Padangbai. Where I was never meant to stay. And where I can’t bear to leave. Where I pass Doreen in the streets and am greeted warmly by name with a soft squeeze of my right hand. Where locals offere massages and when declined, stay to chat with you anyway. Where everyone wants to know where you’re from and what your name is and of course, if you’re married. Where everyone tells the truth because, they assure you, if they lie they have bad karma. 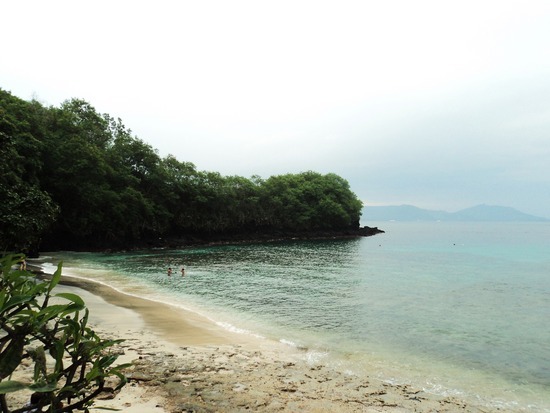 Padangbai… my second home. 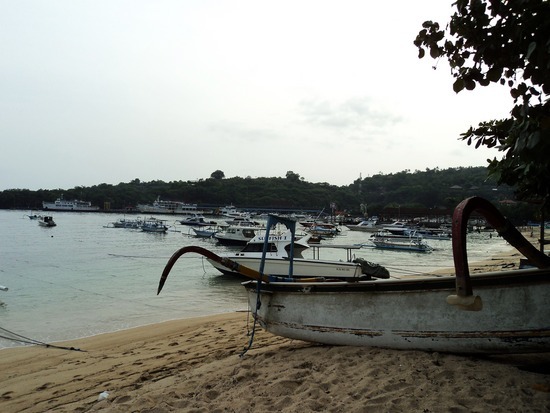 So… I showed up in Padangbai and got off my shuttle bus to catch my “fast boat” that I had booked to Gili Islands. Only to find out, there was no boat that day. And what I had paid for was the 8 hour ferry ride… not the fast boat. Even though I confirmed and re-confirmed that is what I was getting. Remember what I was telling you about Kuta and the scams? I was standing there, fuming, as they told me I could spend the night here in this little port town and go the next day. But that would mean I’d be traveling for 16 hours for about 36 hours on the island. And how is that at all worthwhile? I looked around me and the street was empty. Silent. Abandoned. With one hotel and one restaurant as far as I could see. I tried to stay calm, although I was failing miserably at it. I began to walk towards the hotel. And turned a corner. And then, another corner. And there… there was the actual town. What I was seeing before was only the outskirts. The port. And it was really quite lovely. Very quiet still, but not silent. Quaint. Beautiful. 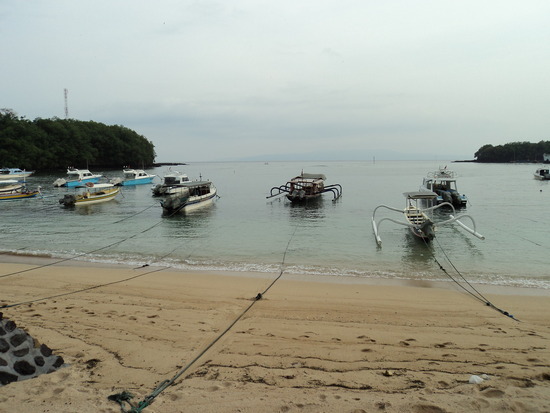 A sandy beach docked with scattered boats. A few tourists, a few locals, strolling contently through town. I let out a sigh and kept walking along the beach, popping my head into each hotel to inquire about costs. 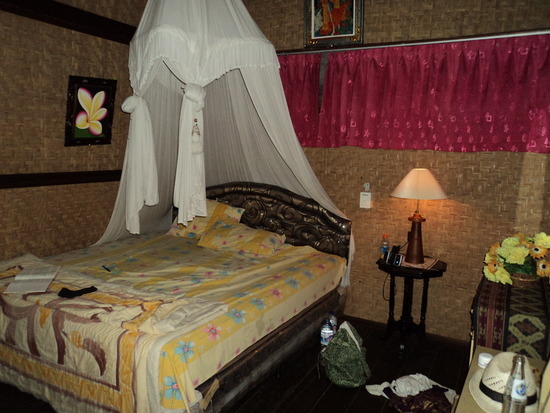 I came up to Kerti Bungalows and they showed me their rooms. It was a private loft/cabin type room. Downstairs I had a big bathroom with clean tile floors and a seating area where I could take my breakfast. And upstairs was my room. For 100,000idr, I took it. I relaxed into my massage, thanked my darling Doreen who held my hand in hers after I thanked her and smiled at me. Wishing me well. Wishing me good karma and good times in Padangbai. I walked back to my hotel and climbed the stairs to my room, and fell asleep. After my much needed 10 hour rest, skipping dinner and the rest of the night, I awoke feeling lighter. I decided to take this day and relax here in Padangbai. Enjoy the solitude. Relax and do nothing. Catch up on my blogging. Read. Sleep. Eat. And so, that’s what I did. When it was hot out, I layed in the sun and made great progress in my latest read: Three Cups of Tea. When it rained, which it did often in the afternoons, I caught up on my blogging, emailed my family and friends and ate beautiful seafood lunches (which I always ended up sharing with someone I had just met whether it was two middle-aged German and Dutch divers or a pair of Americans living and traveling in Bali). After lunch on Saturday, I sat enjoying a big bottle of Bintang, still waiting out the rain and enjoying the piped in music while the rain kept falling. A local man named Eka approached me and sat down at the table. We talked and talked for over an hour. He spoke, at least on some level, five languages! And, as it turns out, was playing music that night at the local reggae bar. He invited me to come, which of course, I could not pass up. Live music? I’m there. When evening set in, I got dressed and took myself to dinner before the show. And there I sat, on the evening of what could quite possibly be the most relaxing day of my life, where time had passed easily reading and walking and striking up unexpected conversations, sipping my ice ginger tea sweetened only slightly with sugar water, swelling with happiness. I enjoyed the best meal yet on my trip. Fresh grilled king prawns dipped in garlic butter and a fist-sized dome of sticky rice with only $3.50. Perfection. And after I was full to the brim, I walked through the dark little town to find the tiniest little bar I’ve ever seen. It was like a hallway, and nothing more. The band set up pressed up against the side of this “hallway” and I sat at the bar where the funny bartender poured me a gin and tonic (which by the way was a shock to my system after only drinking beer for so long, and yes, me, the girl exempt from hangovers, was not feeling too well the following day). I spent the evening swaying and singing along to some classic covers. The likes of U2, Cold Play, The Eagles… and of course, the most universal music out there, Bob Marley. The crowd was small enough that we all made friends and danced together, sweating profusely in that little space. The locals were friendly. The lone travelers I met were fun. There was this one guy from France who was traveling alone and flirting with local Balinese women who got up to dance. Well, he danced the entire time actually. And oh man, it was the epitimy of “white man dancing”. Oh man. If only I had that on video. But regardless, we were all having a ridiculously good time. Everyone was best friends for the evening. At some point, after the music ceased and the gin had hit hard enough that I could no longer converse with the group of locals I was sitting with in the evening heat, I head for home. The next day, just before I left to head back to Kuta (one more night until I left for Philippines), the most special thing happened. I had noticed that my friend Eka, and all my other new friends as well, we wearing these thin black string bracelets on their right wrists. I asked about it. Turns out that in Padangbai all the locals to wear these identical bracelets. They are blessed and they are replaced whenever they break. They are a very special part of being from Padangbai. With my collection of bracelets, I told my new friends how much I would love to have one of these as a souvenier. They shook their heads saying only people from Padangbai could have them. I asked if I would get one if I moved there. They said, yes, after six months. I sighed. Disappointed. And said how much I loved Padangbai and thought it would be a special momento. The brilliant drummer from the band with the unreal afro thought for a moment and asked if maybe I consider Padangbai another home? A second home? I said perhaps. The next day, he pulled up to my hotel and presented me with my very own black string bracelet. He said he had to ask his father, and tell him how much I loved it here and that now I was a part of Padangbai. That I could consider it my second home. And although it’s not blessed and is absolutely simple, I beam everytime I look down at it. Thanks Padangbai, for being so lovely.